Wash the bell pepper, eggplant and zucchini and cut into diamonds. Finely dice the onions. Dice the garlic very finely. Remove the skin from the tomatoes and dice. Lightly brown the pine nuts in a Hexagon frying pan. Remove any bones and innards from the shrimps. Sear the diced onion with oil olive oil in a STAUB Cocotte until translucent then add the bell pepper, eggplant, zucchini and garlic cube and lightly sear all the ingredients. Add the tomato juice and simmer everything for 15 minutes until soft. Meanwhile season the shrimps with salt and pepper and sear. At the end of the cooking time add the chopped herbs and cubed tomatoes to the ratatouille and season with salt and pepper. 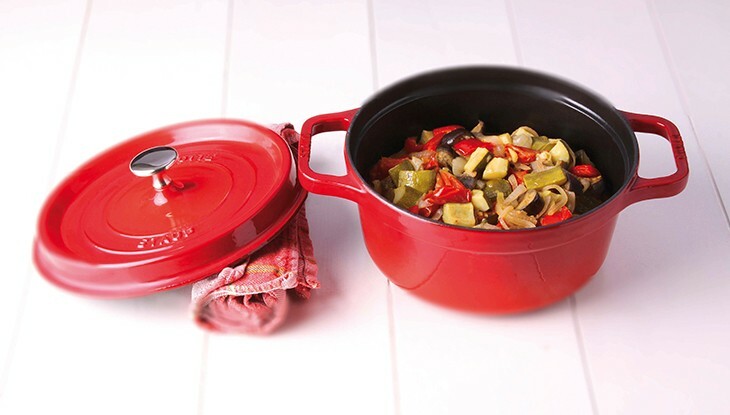 Ideally this dish is served on the table in the STAUB Cocotte. Before serving arrange the fried shrimps and the pine nuts on the top of the ratatouille and garnish with basil leaves.